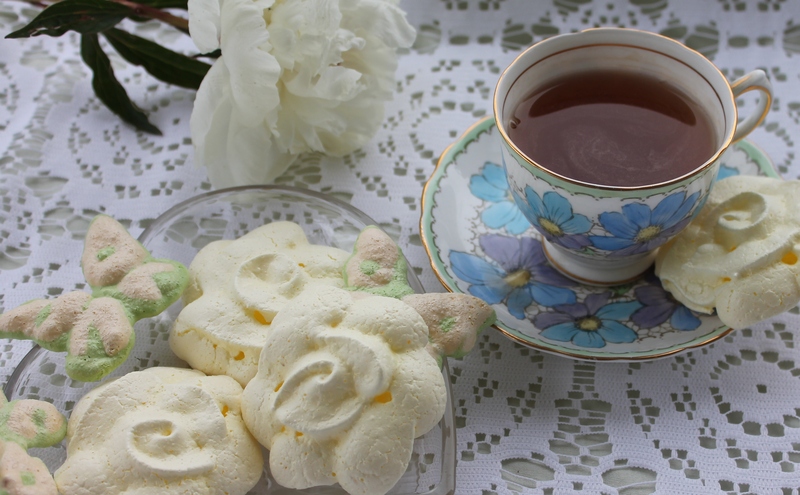 Here’s a light little “puff” of lemony sweetness for you – perfect for a summer dessert. Reminiscent of cotton candy, it disappears in your mouth the second you bite into it…surprising and addicting. One is definitely not enough! Making these won’t heat up your kitchen and they can be as simple or creative as you like. I began by piping roses and butterflies, but then (curse this lack of stick-to-itiveness) I took the easy route and used a scoop for the remaining batter, sprinkling them with nonpareils. You can see by the photo that the butterflies were a little overcooked. They’re thinner than the other options, and I should have compensated for that. 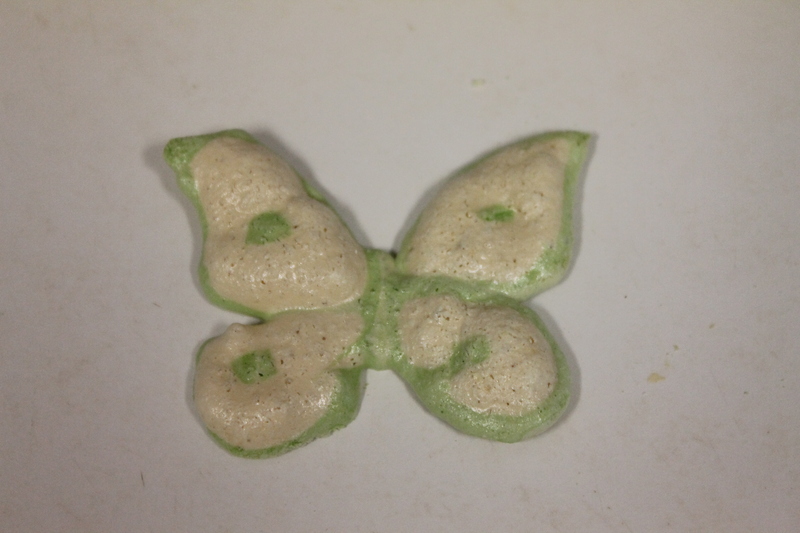 If you decide to make butterflies, only bake them for 25 minutes before turning off the oven. 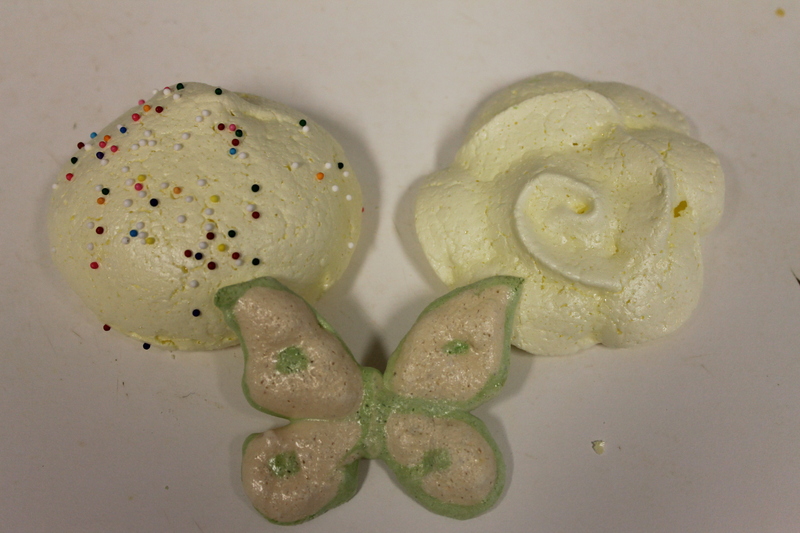 Meringues are very versatile. In the past I’ve added pecans, cocoa powder, chopped chocolate and cherries. The important thing is to limit the amount of added goodies, and fold additions in gently so the egg whites stay fluffy. And I have to say, sometimes they’re better without all the bells and whistles. These just have lemon extract in them, and they’re light and refreshing. Here’s the recipe. I’ll explain how to make the different shapes below. Makes about 24 large meringues. Prepare two baking sheets by spraying with cooking spray containing flour, or by using parchment. 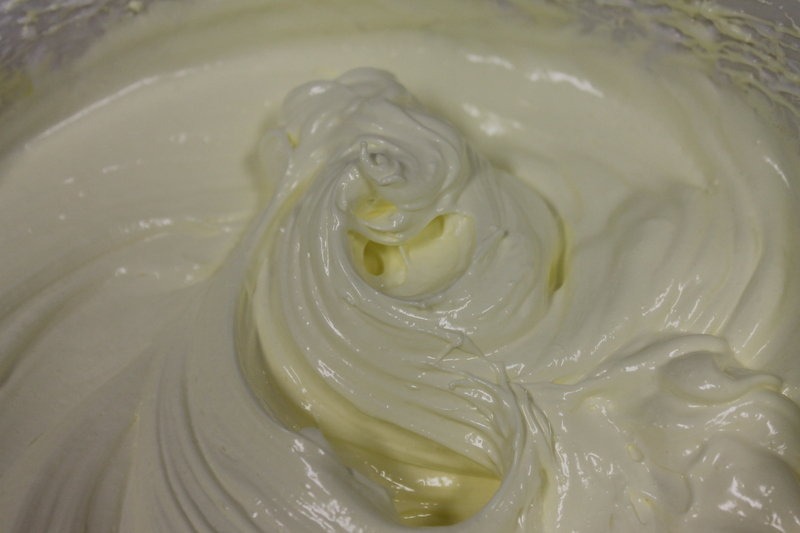 In a medium-sized mixing bowl, whip the egg whites and cream of tartar on medium high speed until they hold a soft peak. Add the sugar, a little at a time, beating with each addition. 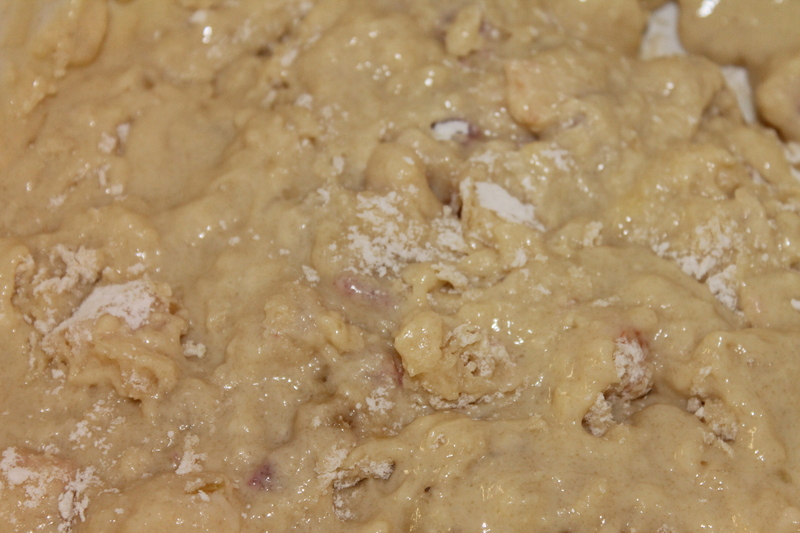 Continue to beat until the mixture holds a stiff peak. Mix in the lemon extract and food color. The extract will thin the egg mixture. Beat on high until it holds stiff peaks again. Pipe or drop onto prepared baking sheets. Bake for 35 minutes, then (without opening the oven door) turn off the oven and allow the cookies to sit for one hour. 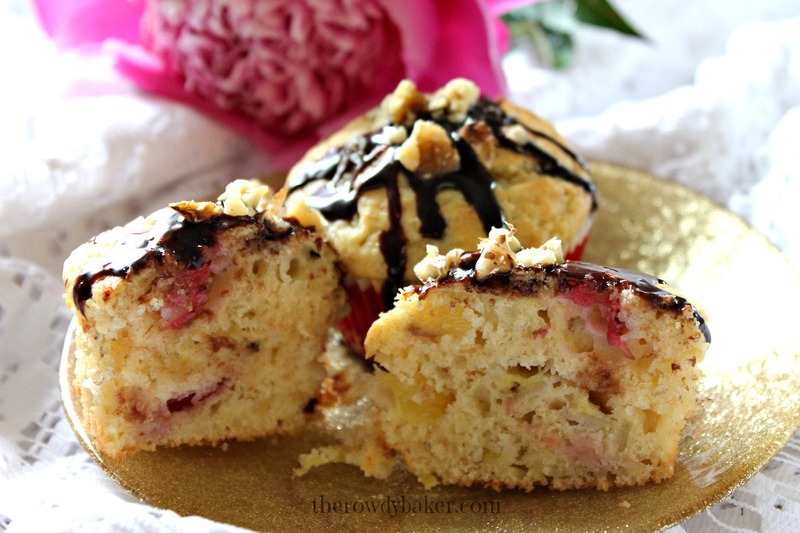 If you make these at night, just leave them in the oven to cool overnight. See? How easy is THAT? Now let’s jazz ’em up. If you’ve ever made frosting roses, you already know how to do these. 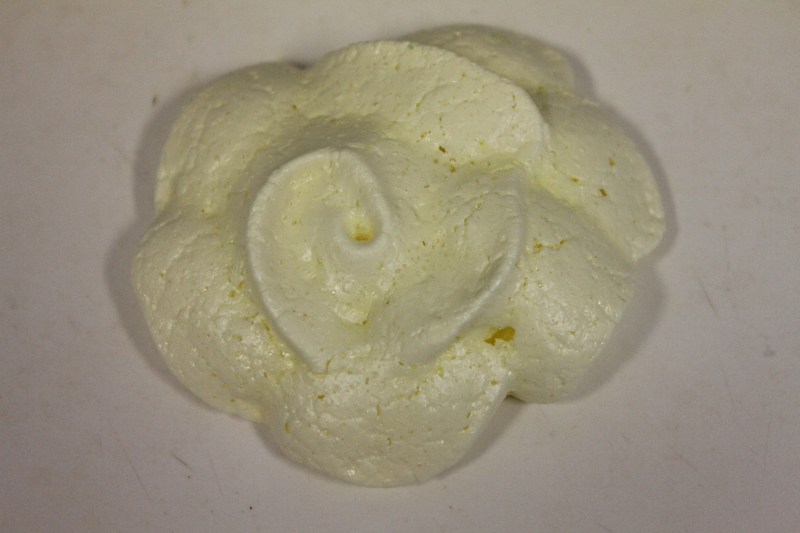 Put a 2″x2″ square of parchment on a flower nail using a little meringue to make the paper stick firmly. 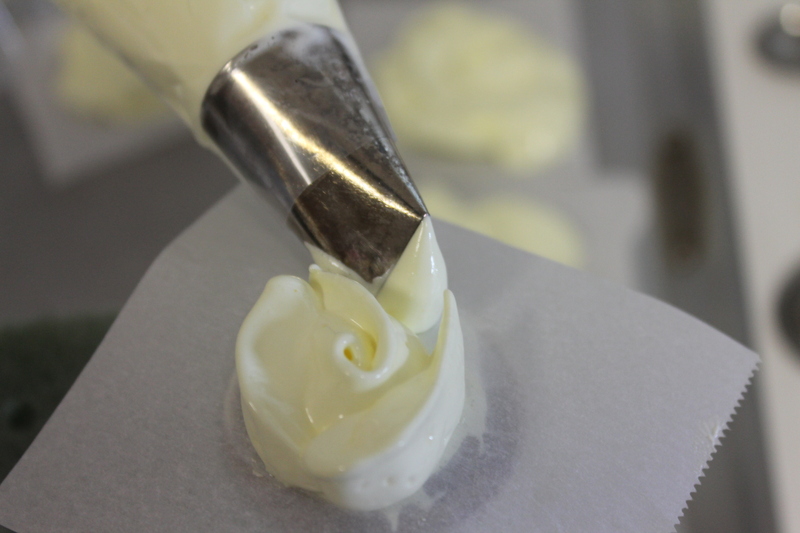 Fill a pastry bag with the meringue and, using a rose tip, make a cone shape in the middle. Begin with a “cone” of meringue in the center of parchment square. 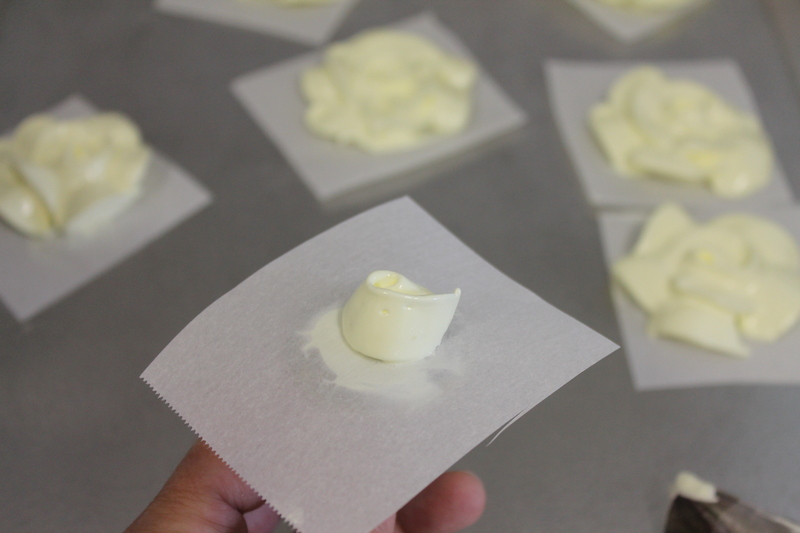 Squeeze the pastry bag firmly to make nice, fat, petals, going around two or three times. 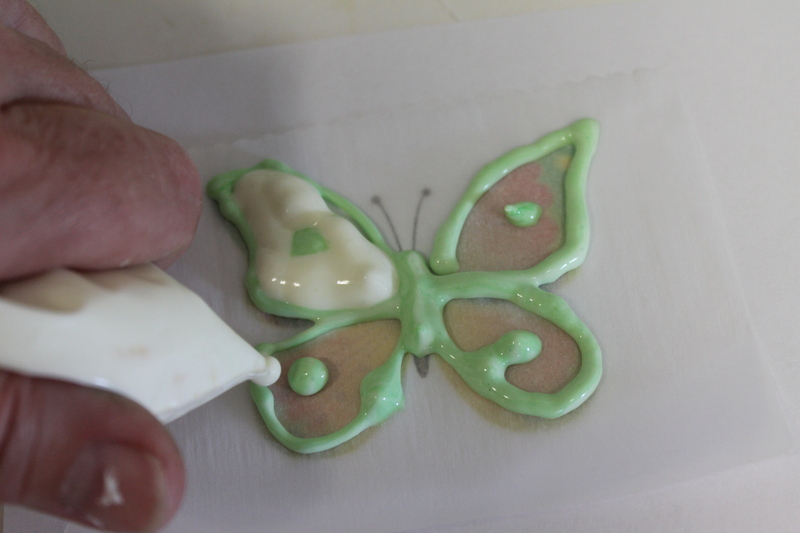 Carefully slide the parchment and rose onto a baking sheet. Repeat until you get tired of it, then scoop. Hahaha, oh yeah, that’s me. I’m sure you’ll diligently pipe all of the roses. I made my butterflies using just two colors, but you could definitely go a little wild here. Add a little food coloring to small bowls of meringue, stirring gently, and put each color in a plastic zipper bag, snipping a tip off for piping. If you’re the artistic type, go ahead and freehand your butterflies. Mine would have probably looked like vultures or something if I’d tried that, so I printed out a butterfly shape I liked from the internet and put a square of parchment over it. I could see the shape clearly through the parchment and simply outlined the wings with my darker color, added a couple of designs, then filled in with my lighter color. 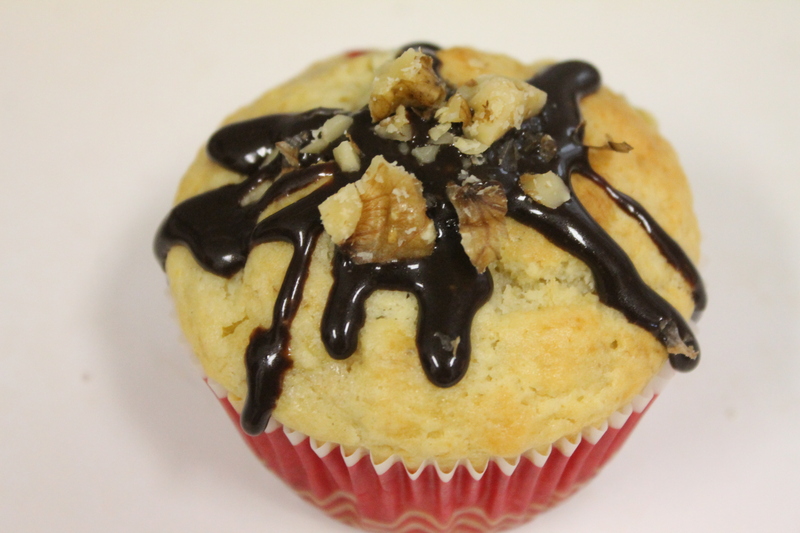 You may want to paint the “body” with chocolate after the cookie cools, but I kept it simple. Don’t forget to cut your baking time back to 25 minutes to avoid browning. And…easiest of all, the cookie scoop method. Line the baking sheet with parchment and just scoop them on there. 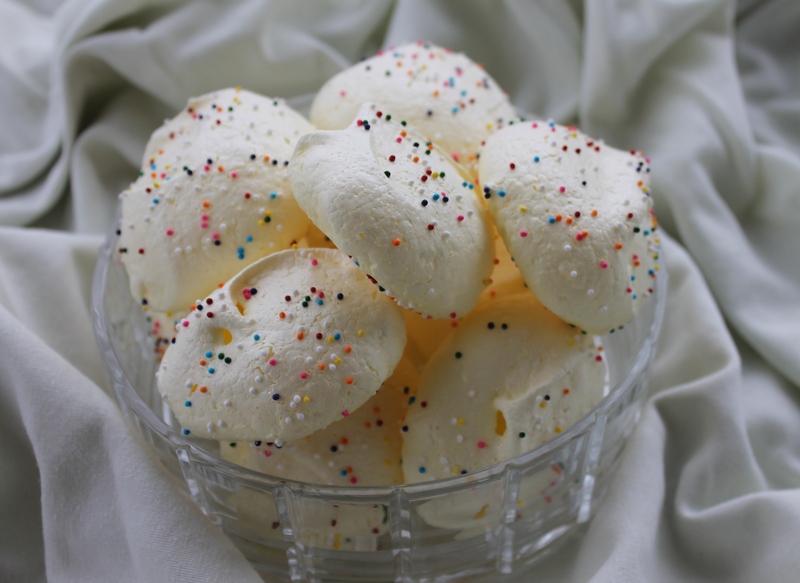 Sprinkle with nonpareils if you like – I think they look really festive that way. Don’t forget to store them in an airtight container – that is, IF there are any left. Just a suggestion: dump out a box of some ghastly cereal that no one likes (something with “bran” in the name is good) and hide them in there. It works well for me! My lips are sealed. Welcome to June’s Fly on the Wall, where you pretend to be a fly on the wall of 14 bloggers, and we in turn give you the down and dirty details of our daily lives. When you’re finished going through my dirty laundry, please click on the links at the bottom for more! I am amazed that you took time out of your garage party schedule to come hang out on my wall. Seriously…how many of there ARE you and why do you love my garage so much? Don’t make me release the spiders! So. The neighbor’s cows were trying to visit again, and The Man was out of town picking up his new truck and then visiting the grandbabies in California and friends and family in Oregon. (Don’t EVEN get me started on the unfairness of that.) I briefly considered grabbing his .44 and leaping on the quad, yelling “Yee Haw”, but then I remembered I didn’t know how to start the quad. I closed the gate instead. Youngest son buzzed by for a quick visit to see what was on his seven – count ’em, SEVEN! 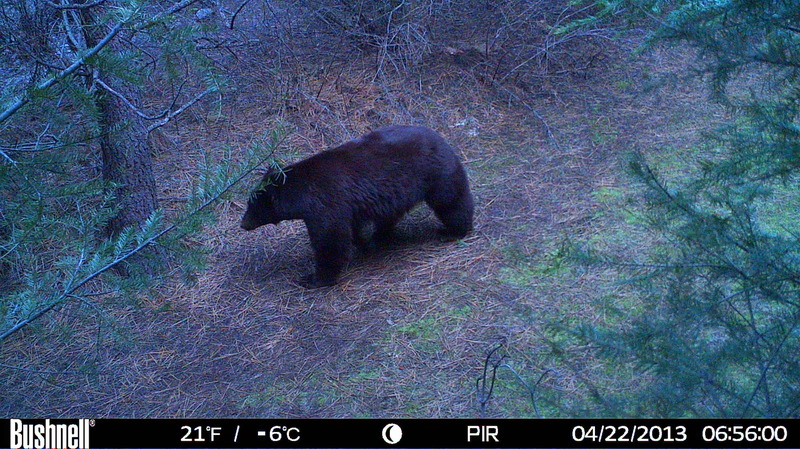 – game cameras that are spread with scientific precision through the nearby woods. Moose, elk, bear, cougar, bobcat, rabbit, and skunk were caught posing for the cameras. Needless to say, I’m going to be a wee bit nervous next month when it’s huckleberry picking season. He also, bless his heart, brought a lovely summer cold with him. As soon as he left, you probably saw me with gloves and bleach, cleaning any surface he might have touched. I’m no germaphobe (after all, you houseflies carry almost two million kinds of bacteria, and I’m letting you hang on my wall unmolested) but I also don’t have time to be sick! Here’s this month’s before and after picture. 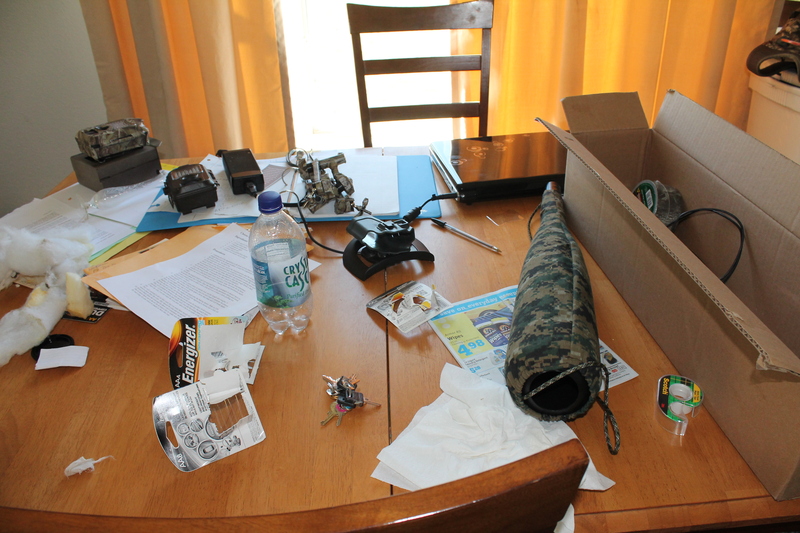 Dining room table before my son’s visit. 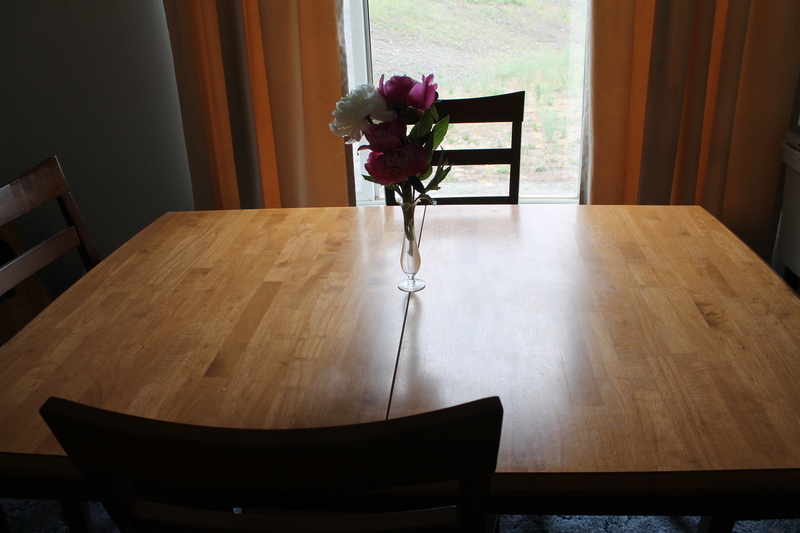 Dining room during son’s visit. Did you hear about the fly that flew through a screen door? He strained himself. 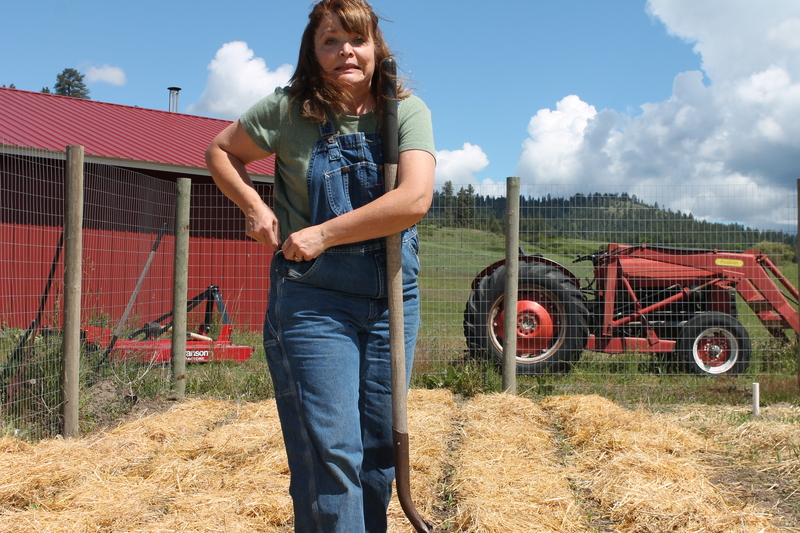 I guess I could break down and buy some “mom jeans”, but I think I’d rather sport the overalls…though they come with their own problems. For one, I look like a complete bumpkin. I know I am, but I don’t necessarily want to look like one! They also are not easily removable if a bug/spider/tick crawls up your leg, and I assure you that tucking the pants into my socks doesn’t help the bumpkin look one little bit. But the BIGGEST problem is, I try to drink a lot of water to stay hydrated when I’m slaving away, and when nature calls there are gloves that need to be removed and four devious little hooks and buttons that need to be undone in a big hurry on the way to the house. 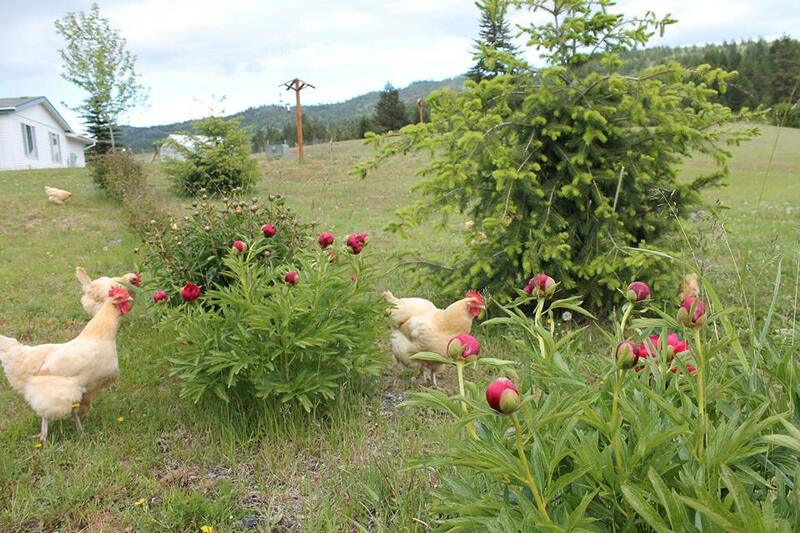 While urine is actually a very good garden fertilizer, I think it should be used in a more controlled manner, if at all. 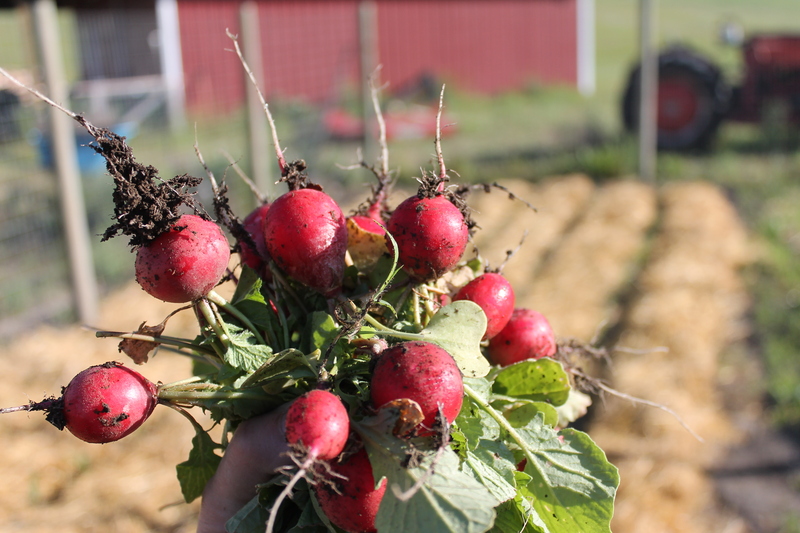 I think the overalls are going to go the way of gardening gloves – good intentions will be tossed aside – and if you stick around long enough you’ll probably see me heading out there in my jammies. I love baby showers, and took these hors d’oeuvres to one given for my friend Taylor, who’s having twins in August. They’re poopy baby diaper appetizers. You don’t need a recipe. 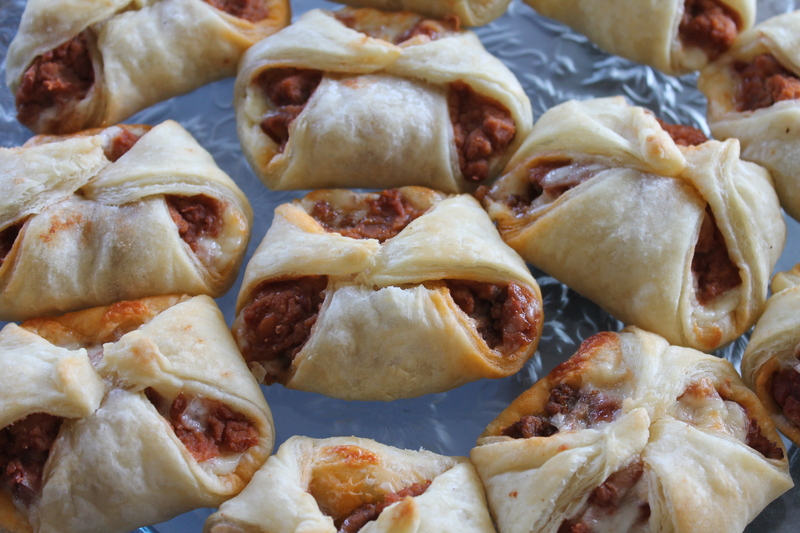 Just roll out puff pastry, cut it into triangles, smear with a mixture of refried beans and browned burger, fold up into a diaper shape, and bake at 400F until they’re lightly brown. Bet you can’t eat just one! Poopy baby diaper puff pastries. Yummmm. Anyone want a dog? 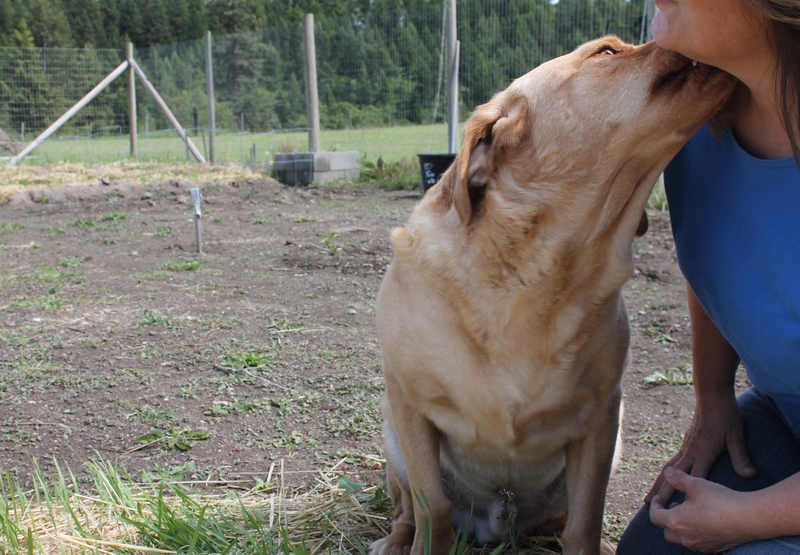 He’s a very nice four year old yellow lab. He was a rescue dog, and while he’s improved immensely, he still has a neurosis or two. We can safely leave him at home now, but if he’s left in the house for even a few minutes when someone is here visiting, he chews something. He just can’t handle being inside while everyone else is out. 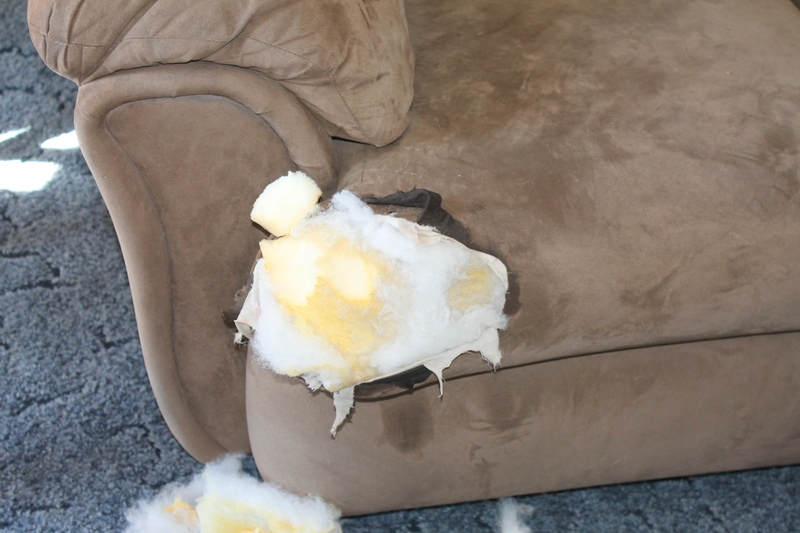 When he chewed up my couch, we hauled it to the dump and made do with just the loveseat and a couple of recliners. But…a neighbor came by and I was talking to her for just a minute (and didn’t want Otis to jump on her) so I left him in. A minute turned into twenty, and this…THIS is what happened. My poor loveseat. Why do they make cushions that you can’t remove without tearing out staples? You can’t exactly patch something like that, either. What you can do is take a lovely fleece throw and tuck it in all around. Good enough! 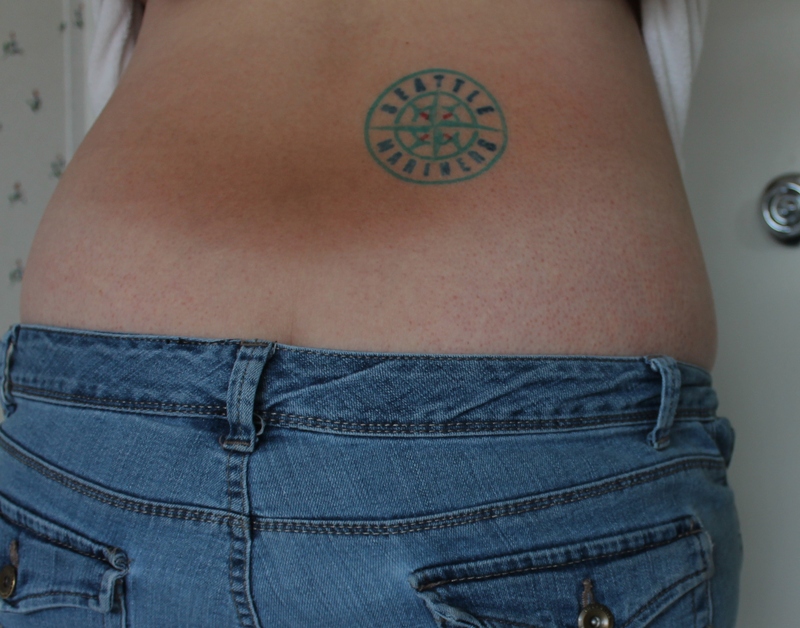 And…neuroses and all, I guess I’ll keep that bad boy. He’s very sorry. Sorry, Mom. Please don’t hang one of those shame signs around my neck! 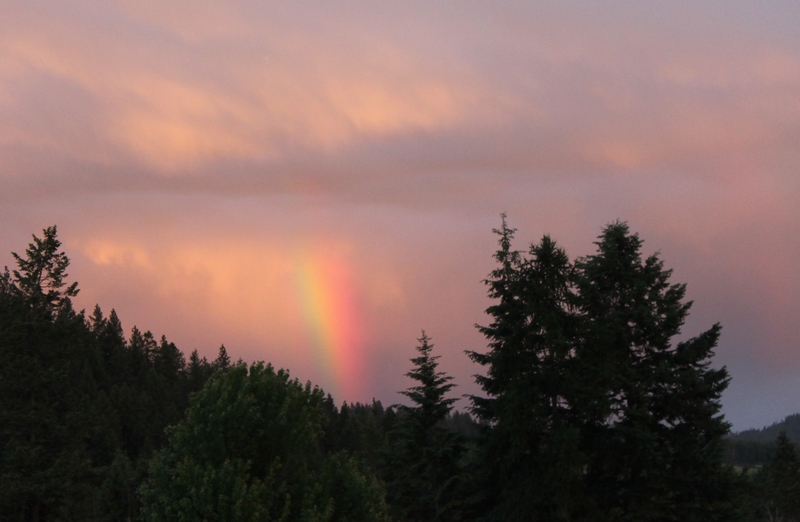 I know this isn’t funny or clever or shocking, but I got some beautiful photos here this month and want to share them with you. Nope, they never ever grow up!!! Crispy and crackly on the outside, soft and tender on the inside…that, my fellow carb fiends, is a perfect French roll. 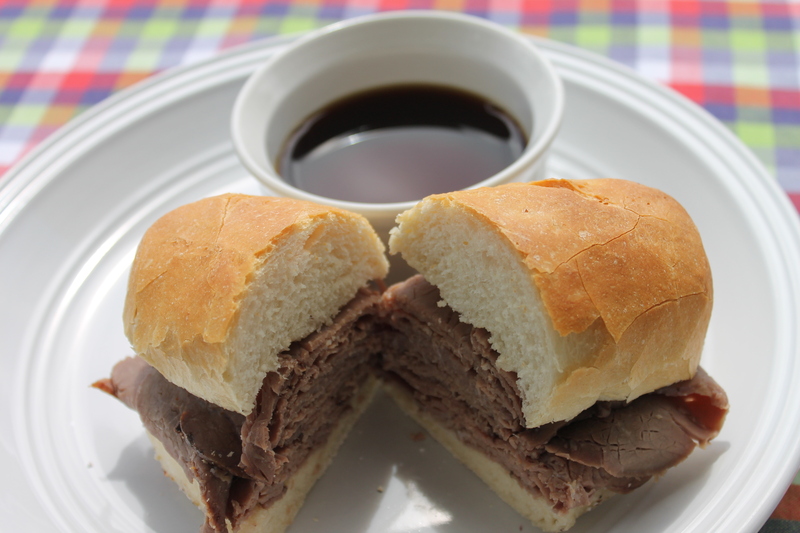 Dip it in au jus, slather it with butter and pull it apart piece by piece, or make it into the perfect “Dagwood Sandwich”. Make large round balls of dough and bake your own bowls for chili or stew. 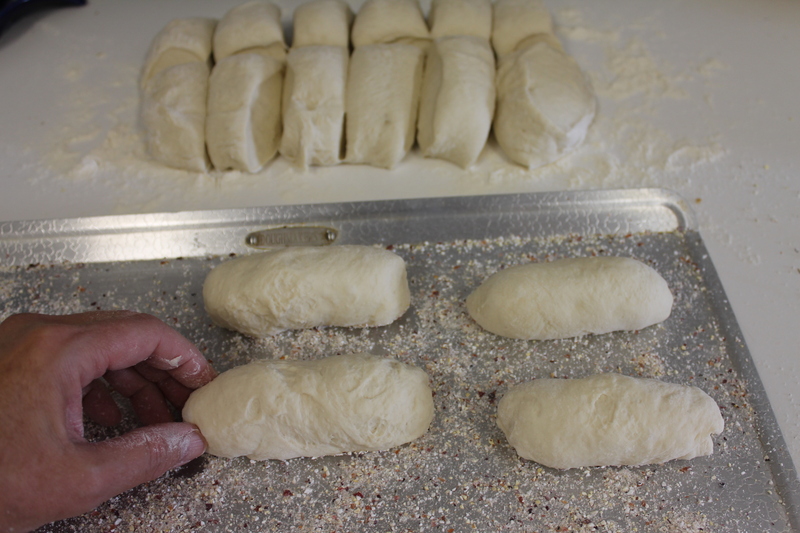 Roll the dough out and cut it into strips for bread sticks. If you’re drooling right now, just think how I’m feeling; in five minutes my fragrant batch of rolls will be out of the oven. The recipe is very simple and basic, but it does rise twice before you form the rolls, so you’ll want to start these rolls when you aren’t in a hurry. One of the things I love most about baking French rolls is the noise they make when they’re cooling on the rack. They crackle and snap – beautiful music to my ears! To make them crispy you need to start preheating the oven (with a big pan of water on the bottom rack) while the formed rolls are rising. This moisture is what makes the flaky crusty goodness on the outside. Be very careful when you open the oven to put the rolls in. It’s unbelievably hot and steamy. WEAR OVEN MITTS! We had these a lot when I was young, usually used for “Dunka Dunka” sandwiches (aka: French Dips) or to accompany a salad. We always had them on Christmas Eve with cracked crab and a salad. Of course, they came in a plastic bag from the grocery store, and I thought they were just wonderful. I also thought Oreos and Jiffy muffins were great, so obviously it took me some time to develop a more sophisticated palate! Try making your own. I guarantee you will enjoy these much more than store bought, and you’ll have the added satisfaction of being able to pronounce all 6 ingredients used in the recipe! In a large mixing bowl, stir sugar into warm water and then stir in the yeast. Let sit until bubbly (about 5 minutes). 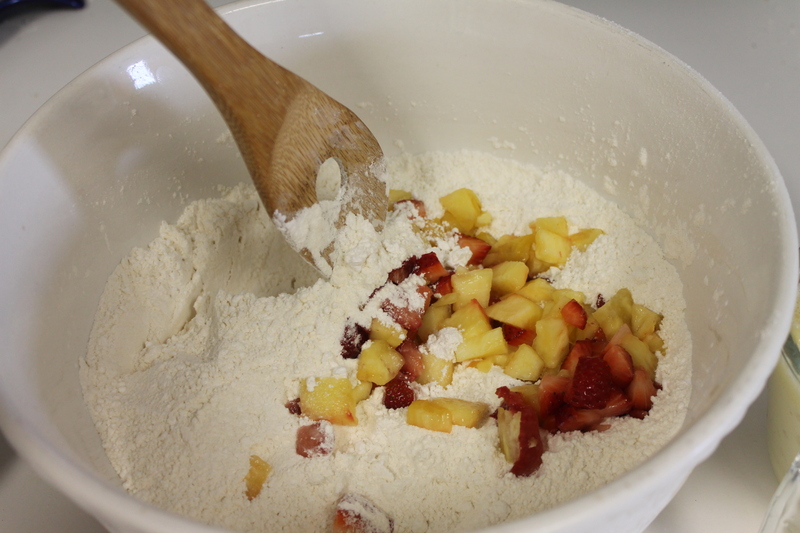 Add 5 cups flour and the salt and beat with electric mixer, using paddles, for 5 minutes. If you prefer to knead by hand, put the remaining cup of flour on the board and knead for 7-8 minutes. If you have a sturdy stand mixer and prefer to let the machine do the hard work, switch to your dough hook, add the remaining cup of flour, and let it knead for 5 minutes. Your finished dough should be smooth and elastic. 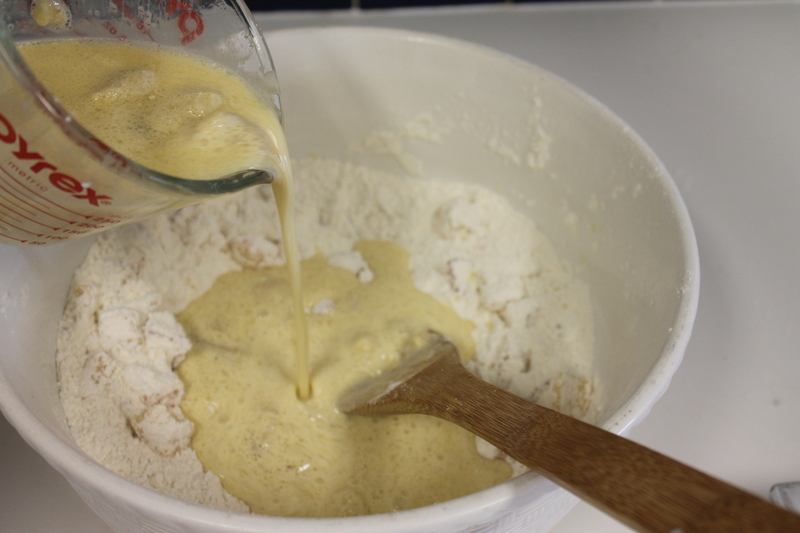 Punch down the dough and place on a lightly floured surface. Cut into 16 pieces. Sprinkle cornmeal generously on two baking sheets. Shape each piece into a ball or oblong and place on prepared baking sheets, at least an inch apart (2 inches is better.) Cover lightly with a clean dishtowel and allow to rise for 45 minutes. While the rolls are rising, place a large pan of water on the bottom rack of the oven, and preheat to 450 F.
When the rolls have risen, dust them with flour and, with a very sharp knife or razor blade, cut a ¼" deep line down the middle of each oblong roll, or an "x" on round rolls. Carefully (it will be HOT) open the oven door and quickly put the rolls in, trying to let as little steam escape as possible. Bake until light brown, about 20-25 minutes, and cool on a rack. Listen to them crackle! 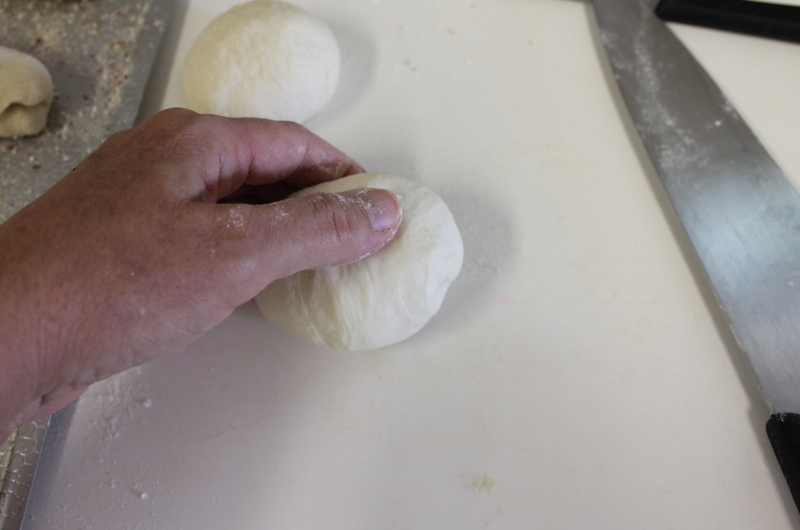 To form rolls, first pull up all the sides like a steamed dumpling! Turn the dough over and pull gently towards you, tucking under as you go. Hot from the oven, crackling noisily!